2. In the circumstances stated by the Commissioner of School Education, AP, in the letter 3rd read above, and after careful examination of the matter, Government hereby issue the following amendments to the aforesaid guidelines issued in G.O. Ms. No. 91, School Education (Exams) Department, Dated 11/12/2017 as amended in the G.O. 2nd read above. 3. Para 7 (3) (d) shall be omitted. There will be Two Papers for the TET Paper-I will be for a person who intends to be a teacher for Classes I to V, Paper-II will be for a person who intends to be a teacher for Classes VI to VIII. A person who intends to be a Teacher either for Classes I to V or for Classes VI to VIII shall have to appear in both Papers (Paper I and Paper II). 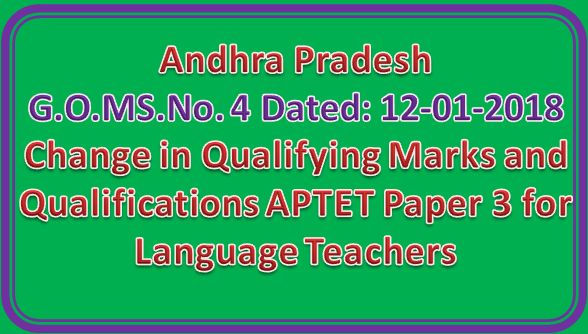 of their study in Pandit Training concerned under Language-I of TET Paper –III. compulsorily choose the Telugu Language under Language I of TET. 2. These orders shall come into force with effect from the date of issue of G.O. Ms. No. 91, School Education (Exams) Department, dated 11/12/2017.